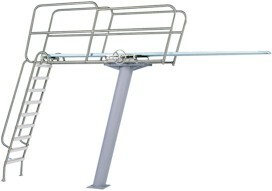 3 meter diving stands, and particularly the ladder on a 3 meter dive stand, pose serious dangers. 3 meter diving stands, while not near as numerous as a few years ago, still exist at recreational pools, where they may not have been modified since the day they were installed. Our opinion is that these dive stands should be removed or radically modified to prevent serious injury. The following is an overview of the risks and recommendations. People may hit the bottom of the pool causing injury to themselves. There have been numerous accidents with children falling off of 3 meter dive stand ladders, because the rails are large in diameter and get slippery when wet. Children’s hands slip off of the rail, often when they are high up the ladder. The other most common accident involves a child falling off the diving board near where the guardrails on the dive stand end, at this point the person is still above concrete. When these accidents happened, children fall 10 feet onto concrete and serious head and other injuries have resulted. It should also be noted that allowing children to climb a 10-foot ladder with concrete underneath is something that would never even be considered on a playground. You may want to view the Consumer Product Safety Commission’s Public Playground Safety Manual. Two internationally recognized safety consultants, Dr. Tom Griffiths and Mr. Michael Oostman, serve as advisors to The Pool Management Group and our Partner Companies. Both of our advisors have stated that 3 meter dive stands with rung ladders are very dangerous and should be modified or removed. Furthermore, our experience within The Pool Management Group family backs up the dangers of these dive stands. Remove the ladder and replace it with stairs that include landings and safety rails with properly spaced rungs. Place protective padding on the pool deck beneath the 3 meter dive stand up to and including the edge of the pool. Install safety netting to catch a person who may slip through or under the railings on the dive stand. Extend the guardrails on the dive stand out beyond the edge of the pool. If you conduct an Internet search for “playground safety surfacing” there are many options for safety padding. There is also information in the previously referred to Public Playground Safety Manual regarding installing cushioning material over hard surfaces, such as concrete. Your state or local Health Department has jurisdiction over modifications made in and around swimming pools, so please be aware that their approval may be required before any changes are made. Secondly, the water into which one dives from a diving board must be a certain depth to be safe, according to industry standards. Some older pools do not have deep enough diving wells, resulting in a situation where a person may hit their head on the bottom of the pool when diving off of the 3 meter diving board and be seriously injured. “Most of the dimensions are measured from a reference point, called the "plummet" which is the center front end of the diving board, in the position where it will be installed. This means that 20 feet in front of the tip of the diving board on a 3 meter stand the water must be at least 11 ft. 3 in. deep to provide reasonable protection against hitting the bottom of the pool. Even if the pool meets minimum depth requirements, divers should take care to dive into the deepest water and steer underwater in such a way to avoid the bottom and sides of the pool. In closing, 3 meter diving boards and stands pose a danger to children and adults and should be closed, unless the pool is deep enough and modifications have been made to the stand and the pool deck. Even with these changes, there are inherent risks in being 10 feet high above a swimming pool deck and swimming pool.